It is a very straightforward recipe and we even used pre-prepared pastry as making puff-pastry takes loads of skill and time. My mother-in-law does her own pastry which makes this pie tastier, while my grandma used to send me to the Pastizzeria (Traditional Maltese pasty shop) to buy her pastry from there, oh what memories!. There is a secret to this recipe which is, using Tomato Paste instead of any other tomatoes/tinned tomatoes. Heat the oil and add the carrots and onion and cook until carrots are soft. If necessary add a little water. In the meantime cook the potatoes, do not cook them too much, you can boil, microwave or steam them. Cut them in 4 and set aside. When carrots & onion are cooked, add the corned beef and tomato paste. Give it a good stir and simmer for a couple of minutes until the corned beef smashes down. Stir well again and turn off the heat. Mash the potatoes and stir them in. Set the mixture aside. 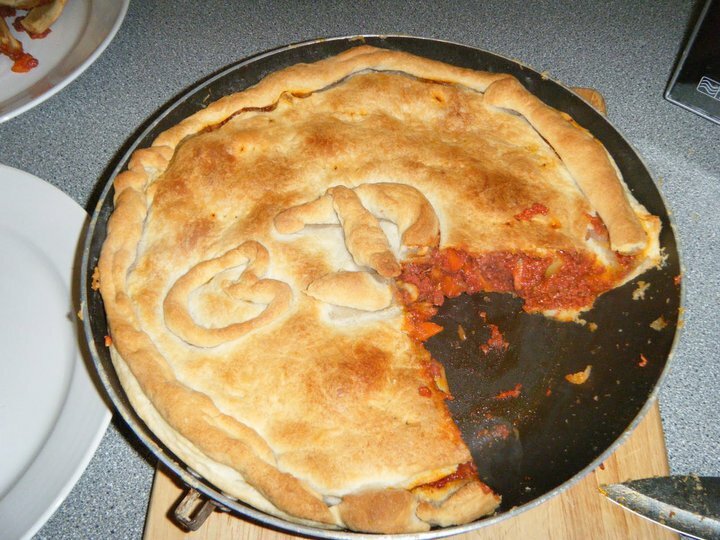 Roll out the pastry and put it onto an oiled/buttered 28cm round pie dish and prick the base with a fork. Add the corned beef mixture and cover with the remainder of the pastry. Prick the top as well so excessive steam comes out of the pie. Cook in the preheated oven for about 30 minutes or until pastry is golden. This entry was posted in Beef, Recipes, Sunday Lunch and tagged beef, food, meat, Recipes, torta, traditional maltese recipes. Bookmark the permalink. This is the recipe i have always used myself , i think it is very tradtional and tastes fantastic. and very easy to make.thank you for share i have it now in my favourties. I also add a large can of peas, but omit the tomato paste. This pie is very delicious and very easy to prepare. Very good for the winter, when you need hearty food to keep you warm. yeah we put peas as well and my momin-law she does the pastizzi pastry herself very good, I never did it!! !